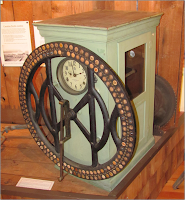 Recently many of our Museum visitors have queried, “What is this?” when looking at our lumber mill exhibit. The new addition they are looking at is the International Dial Recorder time clock used in Flavelle Cedar Sawmill from 1924-34. It recorded the number of employees over a certain pay period on paper and was made by International Business machines (known today as IBM). The Dial Recorders were produced in three different sizes for 50, 100, or 150 employees. They could record different lengths of pay periods including, daily, weekly, and eight day or quadric-monthly. All International Dial Recorders were fully automatic which was state of the art business equipment at the time. Each number on the dial corresponds to a space bar which locates a drum for printing information in the proper space. This ensures that a new record is not typed over an existing one. At a predetermined time, the carriage shifts from one day’s space to the next and restores the spacing bars to their original position to prepare for the next day’s registrations. But not everyone is baffled by this strange machine. For some, it brings back memories. This was the case for Harold Barrow when he came to the Museum this summer. He immediately recognized the contraption and went straight to the number that was his father’s employee number at the mill for many years. He remembers punching in for his father often as a child. We would like to thank the Coquitlam Heritage Society for their generous donation of this piece of Port Moody’s history. We are happy to give it a new home here.